Port Moody, a relatively sleepy suburb of Vancouver. Often overlooked in favour of Coquitlam, it isn't known for being a food mecca. However, if you look closely enough or if you are fortunate enough to live in the community, you will find hidden gems such as Rehanah's Roti and Rosa's. With the huge representation of Japanese cuisine in the lower mainland, this may be one of the last places you would find good Japanese food. Today, Pomegranate and I put this to the test in our visit to Namoo, which incidentally is run by Koreans. Hey, I have no issue with that since I don't mind going to Sushi Town and Sushi Oyama. It's not re ally all that important who makes the food, the food does all the talking. 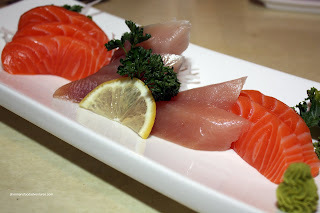 We started with something that is usually one of the purest indicators of freshness - sashimi. As you can see in the picture, there is a nice fresh gloss to the tuna and salmon. And it was fresh in terms of texture and taste. No mushiness here. 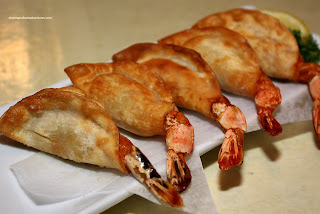 Pomegranate wanted to try the Ebi Gyoza and when they arrived, they sure looked good. However, it was a complete miss in my books. First of all, there was no indication on the menu that it would be fried. There is a big difference between deep-fried and pan-fried gyozas. Secondly, the dumpling wrapper was way too thick resulting in a crusty and doughy texture. It was akin to pie crust, whereas it should have been crunchy and light. One positive was that the shrimp were big and just cooked. For me, I always try out the nigiri at Japanese restaurants. Since there is a big piece of rice underneath each piece, it is a great way of assessing if the sushi rice was made properly. We got 1 pc of tuna, 1 pc inari and 2 pieces of unagi. I found the sushi rice to be a bit dry; although I could de tect some flavour which is a good thing. 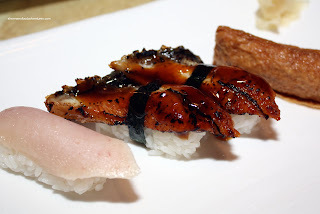 Tuna and unagi were decent, so the nigiri was passable. We ended up ordering 2 specialty rolls which consisted of the Dragon and Red Dragon. Essentially the same roll inside (California Roll), the outside was quite a bit different. The dragon roll was pretty much like any other variation at other Japanese restaurants. 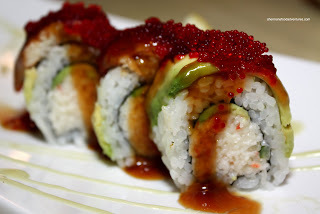 California roll on the inside with avocado, unagi, tobiko and teriyaki sauce on the outside. With the same dry sushi rice, the roll suffered a bit texturally; but made up with a nice balance of ingredients. The Red Dragon Roll was a bit strange. At first, we couldn't even see the darn thing since it was covered completely by fried taro. I tried removing the taro in hopes of taking a nicer photo with no success. 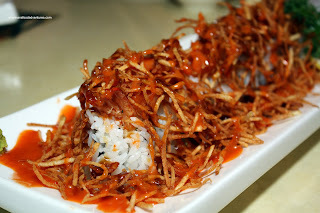 What I did do was destroy the roll by removing the spicy tuna sitting atop the California Roll. We actually liked this roll. With the combination of a standard California roll, with the spicy tuna on top combined with a sweet dressing and crisp fried taro, there were many different flavours and textures at work. This was a pretty nice way to finish off our meal at Namoo. Overall, it was non-offensive and decent. Sure, there were a few issues, such as the dry rice and the gyozas; but nothing was terrible. In fact, there were a few surprises. Of course, there are better choices for Japanese food such as Fuji Sushi which is nearby. Yet, Namoo is alright considering its location. 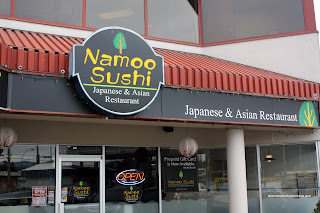 I've been to Namoo before, their bento box was disappointing in my opinion, but they're not terrible. Just down the road, Osamu in Coquitlam is pretty good. Their cooked food is average, but anything from the sushi bar is quite good (especially considering it is Coquitlam). I was there for lunch a week ago, and dinner is better than lunch, though I was pleased to find "lunch sizes" of a couple of my favorites, like their Ahi Poki Salad. Thanks for the tip! I also like Sushi Turnhouse nearby. But I'll definitely try Osamu. Have you tried Osamu yet? Used to go before they renovated. Prices went up and quality/quantity went down. You should have gone during their heyday. Sushi snobs galore would have appreciated it.